Test items：During working status, test the temperature, voltage, current, power and so on. The test instruments they used before can not meet the requirement in precision. High precision, temperature measurement error should be less than 0.7 degrees. PC software can record power and temperature data generate report. Record the electrical parameters and temperature synchronously. Ethernet interface (standard) can realize the remote control and data record function. Meet all the test requirements. Remote monitoring and data recording. Record the electrical parameters and temperature synchronously. It’s convenient to analyze the data. 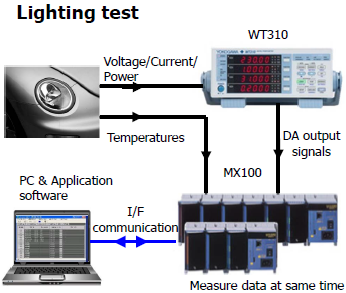 The WT310E/WT330E series has a Command compatibility mode with previous WT210/WT230 series. Under that special operating mode, the WT310E/WT330E series works like the WT310/WT330 series. Please refer to the IM in detail.